On his fourth studio album, singer-songwriter-guitarist John Mayer likens relationships to war. 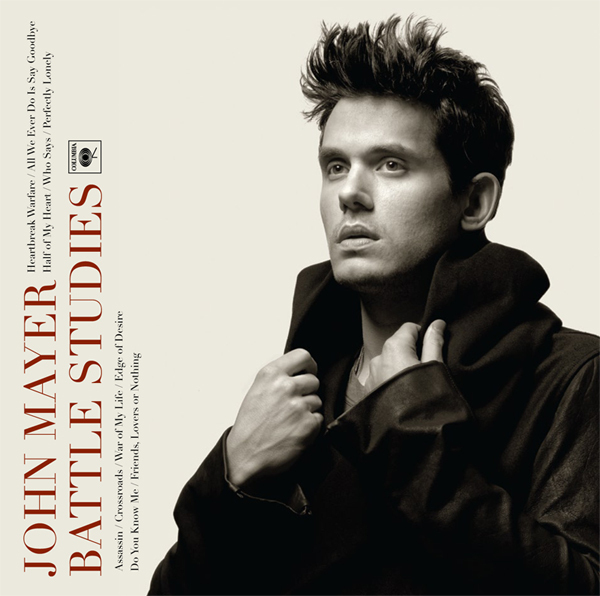 Ironically, Battle Studies might be his quietest, most stripped-away and bare release yet. When one thinks of battle music, bold sweeping sounds come to mind, but Battle Studies manages to convey the intensity of love-gone-sour with simple arrangements, straightforward lyrics and virtually none of the showmanship and guitar bravado Mayer is capable of in his live performances. Album-opener “Heartbreak Warfare” sets the mood, with atmospheric guitars and punchy drums serving as the backdrop to Mayer’s melodramatic croons of “Clouds of sulfur in the air, bombs are falling everywhere.” Songs like “Assassin” and “War of My Life” further the love-is-a-battlefield motif. Perhaps because of that drama, Mayer also delves into his contentment with being alone. He sings “Me in my house alone, who says I can’t get stoned” on first single “Who Says,” which is accompanied by a delicate acoustic guitar and melody and gospel organs. Ultimately, the album is at its best on its rare upbeat moments: Mayer’s cover of blues rock staple “Crossroads” (by Robert Johnson and made famous by Eric Clapton’s Cream) and the album-closing “Friends, Lovers or Nothing.” The latter is an epic modern blues classic that is the album’s best showcase of Mayer’s many talents.